POLITICAL TIDBITS: At its Lipa Assembly last Thursday, Feb. 26, the National Transformation Council (NTC) shifted emphasis and attention from faith and professional leaders to four representatives of humbler sectors; the large crowd listened to their stories about their tough plight. Should NTC come to assume its caretaker role, it would ensure that the marginalized's voice would figure first and foremost in governance, and "great bulk of financial resources would be channeled to improving lower levels of society"---something possible when governance does not involve hard-boiled politicians. At its Lipa Assembly last Thursday, Feb. 26, the National Transformation Council (NTC) shifted emphasis and attention from faith and professional leaders to four representatives of humbler sectors; the large crowd listened to their stories about their tough plight. Should NTC come to assume its caretaker role, it would ensure that the marginalized's voice would figure first and foremost in governance, and "great bulk of financial resources would be channeled to improving lower levels of society"---something possible when governance does not involve hard-boiled politicians. Leaders from poorer sectors of Philippine society had their own gripping stories to tell. 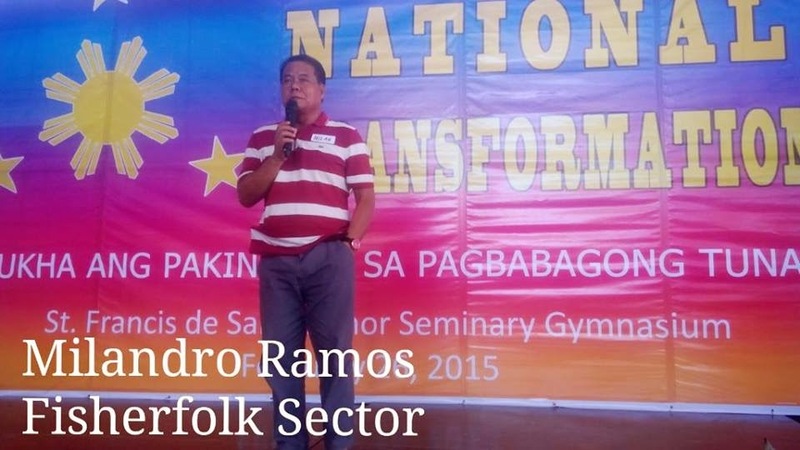 The assembly held by the National Transformation Council (NTC) yesterday, Thursday, Feb. 26, 2015, in Lipa City, Batangas, was different from previous NTC assemblies in the sense that for the first time it was not its citizen-leaders and various faith-leaders affiliated with NTC who delivered the speeches. It was the humbler sectors that usually were not heard in any gathering. The four speakers came from the labor groups, the farmers’ group, the fisher-folk and the urban poor. 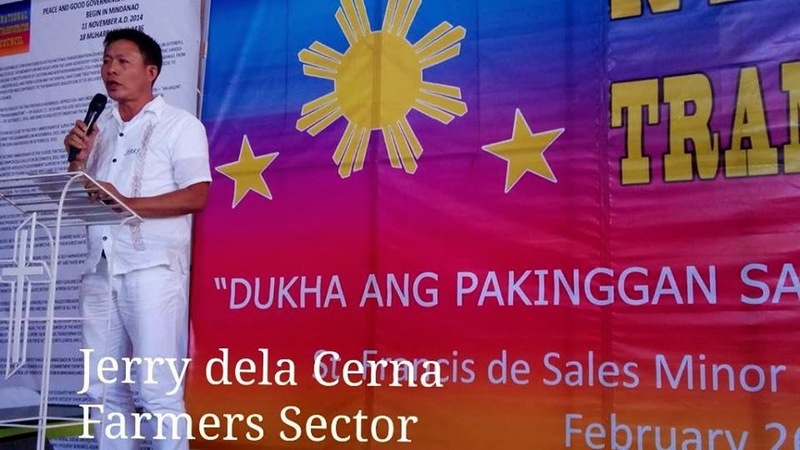 Speaking on the theme "Dukha ang Pakinggan, Sa Pagbabagong Tunay," these sectoral leaders narrated how their constituencies felt neglected by various administrations after being used as "cannon fodder" in various rallies or propaganda campaigns that ushered change of administration. Sadly, once installed in power, past administrations conveniently forgot them. The marginalized sectors’ stories brought tears to many in the audience especially since the latter were already primed up by patriotic songs like “Pilipinas kong Mahal” and “Bayan Ko.” I was among those whose make-up was messed up as I couldn't stop crying (mababaw naman talaga ang luha ko, in the first place). I felt that if the NTC could come into power, it would be the first time in a long while that the poor would really have a meaningful break--- instead of being hidden from papal view or being recipients of the conditional cash transfer that more often than not disappeared into handlers' pockets. Yesterday’s Lipa gathering provided thoughtful and provocative insights into what line of governance the NTC proposes if ever---a marked preferential option for the poor that's possible because its leaders are not hard-boiled politicos. Moreover, as Archbishop Ramon Arguelles of Lipa who hosted the giant gathering, put it, while 2015 has been declared by Pope Francis as the Universal Church’s “Year of Consecrated Life” for all religious, in view of the Bohol and Cebu killer earthquake of last year and super-typhoon Yolanda, the CBCP---with Pope Francis' approval---decided to make both celebration simultaneous. Yesterday the Lipa NTC's manifesto recalled the Pope's declaration in Rome after he arrived from Manila: "The main scope of my visit, and the motive for which I chose to go to the Philippines---this was the main reason---was to be able to express my closeness to our brothers and sisters who suffered the devastation of Typhoon Yolanda. I went to Tacloban, in the region most hit, where I paid homage to the faith and resilience of the local population." Viralled around the world was that unforgettable picture of Pope Francis in his Tacloban see-through raincoat, drenched like everyone else. The "Year of the Consecrated Life" had to take somewhat of a backseat to the "Year of the Poor" mainly because we have so many poor around. NTC's raison d'etre echoed the words of Francis: "I prefer a Church which is bruised, hurting and dirty because it has been out on the streets, rather than a Church which is unhealthy from being confined and clinging to its own security. I do not want a Church concerned with being at the center, which then ends by being caught up in a web of obsessions and procedures." Toward this end NTC faith leaders---Catholic and Protestant bishops and the Ulamas and Imams---"pray and struggle to bring to our people the possibility of a transformed society and a renewed leadership." To achieve this end, they said, "we have to listen to the poor" for after all, as Archbishop Arguelles put it, Jesus was not born in a palace like Herod's, but in a manger in shepherds' field. Or as Davao Archbishop emeritus Fernando Capalla put it yesterday, "This is the challenge to us as God's faithful, particularly at this time of grave trial and testing for our nation. We must let go of our comfort zones, go to the peripheries and find the poor, the powerless, the marginalized, the neglected, the persecuted, the afflicted and the forsaken." And what a story the poorer sectors had to tell. Timoteo A. Aranjuez has been a labor leader since 1959 and he recalled that while Marcos Labor Secretary Blas Ople sought to give workers a minimum wage, the martial law regime prohibited political demos. With the EDSA Revolution they regained those rights and employers and workers were together. 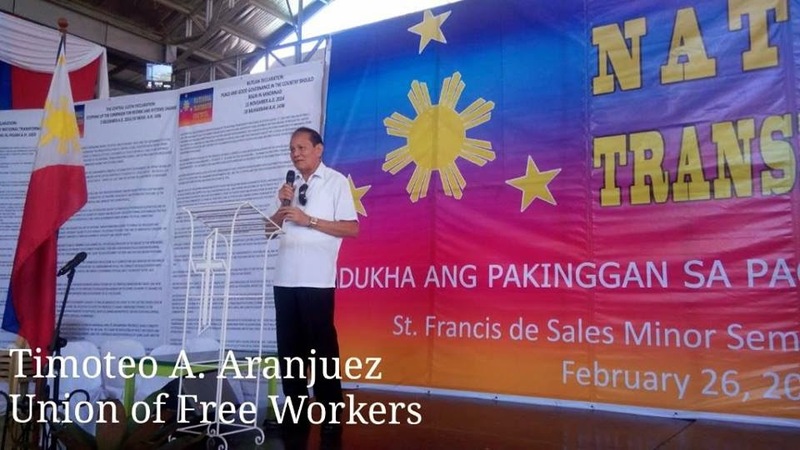 Moreover, under the present Constitution, said Aranjuez, workers are supposed to enjoy security of tenure, living wages and a just share of the fruits of labor. But he asserts what's a well-know labor secret: that workers' security of tenure is jeopardized by some taipans' scheme of five-months work, five months no work (to enjoy continuous work one has to change one's family name, and the aim is obviously so that the employer does not have to get certain work conditions in place); and while workers received wage increase of P10 per day, fares of the MRT were raised two ways, neutralizing this increase. Aranjuez asserted that the Department of Labor belongs to the labor sector and the next secretary should come from the labor sector (this was widely applauded). He also noted that while 70-80 percent of the nation's wealth is controlled by only four families, the doctrine of St. Pope John Paul II is that labor is the creator of capital, not the instrument. This thinking, however, is clearly not shared by the capitalist sector. Milandro Ramos, a Bulakeno who's president of the Association of Fishermen in that part of Luzon, notes that under RA 8550 the 15 km. shoreline became the property of the fisher-folk but this is far from being the case, for despite millions of kms. of shoreline there's no adequate housing for the fishing sector. It's a fact the fisher-folk constitutes one of the poorest sectors in the country. For instance, as Ramos pointed out, whenever there's a warning of a storm coming, "hindi na kami kakain" and their shanties are blown away. 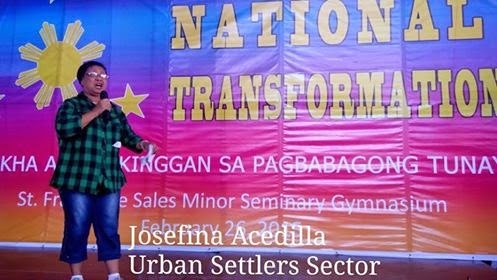 The representative of the urban settlers, Josefina Acedilla of Samar, is a resident of Taguig and a dynamic and irrepressible personality on stage. She sent the NTC crowd rollicking with laughter at her quips and jokes and at some point her statements reeked of doble entendre and faint sexual overtones that mercifully the religious folks in the assembly didn't seem to catch, or pretended not to. Acedilla confessed that it's the "maralitang taga-lungsod" who are always in the forefront of rallies and demos, but their lives are studded with problems too as life in the big city is tough. Life in the rural areas, though, is tougher, as Jerry de la Cerna of Davao Oriental, who represents the farmers' group, attested. A third-generation coconut farmer, Jerry became a priest in 1991 but he left the priesthood in order to pursue his advocacy, which was to stop illegal logging and illegal fishing. He stressed that the Philippines is the "spawning ground of the world," as fish of many many varieties come here to spawn; but because of failure to protect our seas from threats to our rich marine life, our country remains poor. On the other hand, Jerry points out that the coco levy imposed on coconut farmers during the martial law days has by now come up to a staggering P83 billion fund; moreover, while the Supreme Court already categorically declared the coco levy fund FOR THE COCONUT FARMERS in 2012, up to now this fund has remained intact and undistributed to them. The coco farmers remain among the poorest Filipinos and the coconut industry is moribund. De la Serna asked permission from the NTC-affiliated bishops for permission to go fasting for seven days in Lipa City and seven days in Cebu (he plans to survive only on coconut water and its meat) to beg God's help for the cause of the poor coconut farmers. I am not sure what the reaction of the bishops to his request was, but perhaps he and other affected coco-farmers' associations could ask the help of Senate President Franklin Drilon and former Sen. Edgardo Angara Sr. on how best to get hold of the coco levy funds for the farmers' benefit. Drilon and Angara were among the lawyer-partners in the ACCRA Law Office that Angara founded in the Marcos era, who crafted this coco levy fund scheme that the coco farmers considered so oppressive from the start. The least these powerful figures could do is to ensure IN CONSCIENCE that the SC decree is carried out now---to distribute the levy funds to the destitute coco farmers. From the above proceedings of the NTC Assembly in Lipa last Feb. 26, it's easily discernible that should the NTC be able to assume a care-taker role, prior to the writing of a new constitution for our country and parliamentary elections, it will be a NEW ERA for the marginalized sectors. As the NTC manifesto in Lipa put it: "The NTC will aim to have a new system of government where the lower levels, from the barangay to the municipality/city, province and region will have more power than the centralized, oppressive, power-hungry and greedy central national government presently holding sway throughout the whole archipelago. The great bulk of financial resources should be channeled to improve the lower levels of society. Paramount is the conviction that if the huge amount of taxpayers' money is used not for population control but instead for education/skills training and employment opportunities, the Philippines can prove to the world that population is the greatest asset of any country."